This post is sponsored by MyClean. In exchange for a review of their cleaning services, I received a free "Get It Clean," appointment, as well as a discount code to share with all of you, and the chance for three blog readers to win a free cleaning service of their own. All opinions within this blog are mine, and have not been reviewed or approved by MyClean prior to publication. As promised after yesterday's introspective tome about the thing that weighs me down (umm...me), today's post is a fun one, and will give three lucky Chicago readers the opportunity to win a free housecleaning service. You read that correctly, FREE CLEANING. And for those readers who aren't lucky winners, don't worry: MyClean has provided a promo code for all of you good for $50 off your first cleaning service. I like games where everyone wins. Before I give away the goods, let me share my experience with the MyClean. See how happy that lady looks? 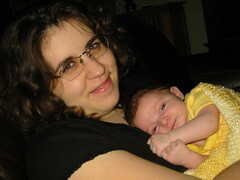 She's happy because she just ordered a cleaning one-handed while her child insisted on being held. Again, everyone wins! If you request recurrent cleanings, you can receive up to a 15% discount, and if you prefer a specific staff member, you can reserve them for your weekly, bi-weekly, or monthly home or office cleanings. Specific services, like event and post-construction clean-up, as well as outdoor space and retail location cleanings, are available as well. I put in my request on Monday, and was able to pick a time for the next day had I needed it. I chose a mid-day Thursday appointment, and our cleaner arrived right on time, ready to go. This was a real feat, as our neighbor, President Obama, came to town in between my cleaning order and the actual appointment, creating a secret service lockdown around our condo. On Wednesday, I received a confirmation of my cleaning, at which point I emailed back to let them know that they would have to park on an adjunct street and come through federal security. Our cleaner, Sherritta (Ritta), had arrived with plenty of time to adjust to this added hurdle, and had all of the information I had provided in my email to make getting to our building possible. If they can arrive through the secret service, I think I can officially endorse them as reliable. Ritta was in our home for roughly eight hours, which is longer than I anticipated. She used a combination of our cleaners and hers, although clients can request that everything used be from their own stock, or that MyClean bring all their environmentally-friendly cleaning products in. Her work was solid, and her personality was wonderful. Even as our dog tried to lick the floors as she cleaned them, she stayed patient and helpful. That puppy was probably just trying to warn her not to work so hard, as roughly 30 minutes after Ritta left, Gracie dunked herself in her water bowl, then ran all over the house with wet paws. Sorry, Ritta. I enjoyed those clean floors for a half-an-hour, I promise. "Naughty? Who me? Why yes, these floors look too clean, let me fix that." Before she left, Ritta gave me this completed checklist, with the items we agreed upon finished. My only additional request would have been vacuuming, but there was not time for this in the end. Ritta pointed out that when clients' homes are vacuumed, it is always done with their own machines, as MyClean does not want to track dust or allergens from one home to another. This morning, I received a follow-up email, thanking me for my service, as asking me to complete a quick survey to review my experience. Best features of MyClean Chicago service: Ease of use, friendly service, effective cleaning. Things I would change, if possible: Add multiple people when necessary to make appointment faster (this can be requested), estimate based on square footage as well as number of rooms to better predict appointment duration. While we have a regular cleaner who has helped us out for many years, I would definitely use MyClean again, especially for deep cleans, or just to mix things up and catch the stuff that neither my family or our regular cleaning person notice. 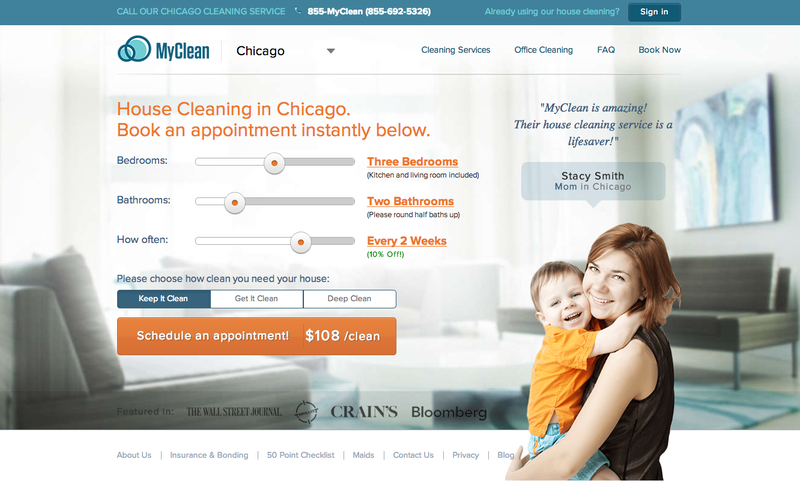 NOW, Chicago friends, don't just take my recommendation, try MyClean for yourself! Koritelling readers can receive a $50 discount on their first service by using promotion code: KoriTelling50. In addition, type a comment on this post about your least favorite housecleaning task (mine is laundry) before 7:00 p.m. CST on Monday, October 6th, and you will be entered to win a FREE CLEANING. Winners will be announced on Tuesday, October 7th, and will have two days to claim their prize (directions to follow on Tuesday), at which point if any are unclaimed, I will chose new entries. A big thank you to MyClean for this giveaway, and for the great experience yesterday. I really don't mind cleaning in general, but I hate mopping the floor. Sweeping...oh how I hate sweeping! With 2 little boys in the house, gotta say BATHROOMS. I'm off to check out their site. I've been saying I need to hire someone for MONTHS. Bathrooms are the worst, too many yucky corners and faucet crevices. I hate cleaning my bathroom too. Thanks for your valuable post, keeping your house or home is the most important thing to be considered in your life. Because the total look will be depends on that only as well as you can live healthy life. Gem Cleaners offer a wide range of cleaning services including domestic and commercial cleaning In Berkshire, Oxfordshire, Surrey Buckinghamshire, Hertfordshire & Some Areas Of London. I actually like what you've acquired here. And I've understand your stuff previous to and you are just extremely wonderful. حملات صيانات دورية وفروية علي يد متخصصين ذو كفاءه في العمل صيانة جليم جاز سوف تجد كافة الاعمال المتطورة في الصيانة علي يد مهندسين ذو كفاءه عالية ومتطورة في الاعمال التصليح . افضل فريق خدمة علاء تجدوه فقط لدينا في صيانة يونيون اير علي اعلي مستوي من خلالنا فقط في جميع مراكز صياناتنا وفي جميع توكيلاتنا المختلفه والمنتشره عبر جميع انحاء جمهورية مصر العربية. اذا كنت تعاني من تلف الاجهزة الكهربائية فالان تستطيع ان تقوم بصيانة الاجهزة الكهربائية علي اعلي مستوي من خلال صيانة يونيفرسال فقط حيث يعتبر لدينا افضل مهندسين الصيانة علي اعلي مستوي والمدربين جيدا فياكبر اماكن الصيانة في مصر وخارج مصر. شركة اسفلت اكبر شركة متخصصه في مجال سفلته طرق في جميع انحاء المملكة العربية السعودية علي اعلي مستوي حيث نستطيع في شركة اسفلت ان نسفلت الطرق السريعه والعاديه علي اعلي مستوي دون وجود اي حفرات او او انخفاضات عن مستوي سطح الارض. احصل علي صيانة علي اعلي مستوي من خلال صيانة وايت ويل علي اعلي مستوي حيث لدينا افضل مهندسين الصيانة والتصليحات في جميع انحاء جمهورية مصر العربيه علي اعلي مستوي من خلالنا فقط وايضا من خلال صيانة وستنجهاوس تستطيع ان تحصل علي افضل خدمات الصيانة وقطع الغيار من خلال مراكزنا وفورعنا في جميع انحاء مصر. بمناسبه انتشار الحشرات في فصل الصيف والتي ينفر منها جميع الافراد اطفال كانوا او كبار تواصل الان مع الشركة الفرنسية اكبر شركات ابادة الحشرات في جميع انحاء جمهروية مصر العربية حيث تستطيع ان تحصل علي اقوي خدمات الابادة و مكافحة الحشرات في مصر. إن شركة تنظيف خزانات بجدة هي أفضل اختيار لكل الباحثين عن الخدمات المتميزة والجيدة حيث أن شركتنا التي تحتل مركز الصدارة في هذا المجال شركة تنظيف خزانات بجدة توفر خدماتها في غسيل الخزانات في جميع أنحاء جدة فنحن حريصون على توصيل خدماتنا لأبعد الأماكن شركة مكافحة الحشرات بجدة شركتنا تسعى دائما وأبدا إلى نيل رضا عملائها الكرام انطلاقا من تقديم أجود الخدمات المنقطعة النظير.